It’s done! Yes, the second of my Christmas knits is knitted, wrapped and left at my parents ready for opening on the big day. Following on from my Milo for my great nephew was the Deinte for his big sister my great niece. 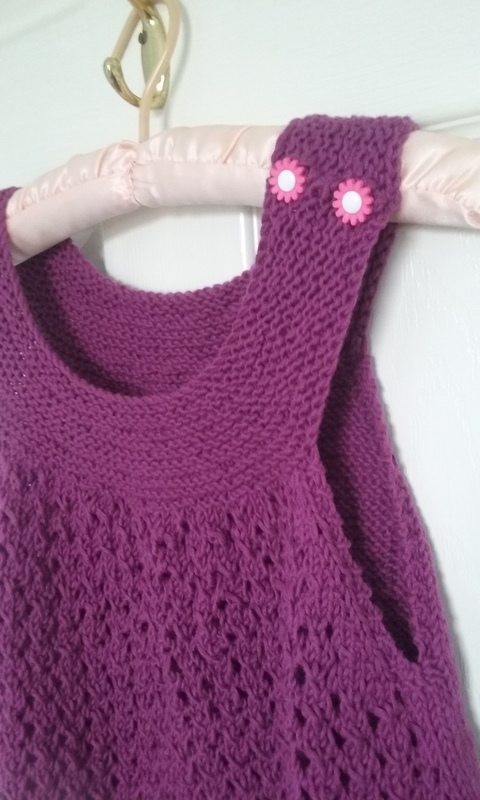 I chose the 6 year old size and there was a surprising amount of knitting in it – well surprising if you don’t really engage your brain to actually consider the size of a 6 year old when you start so you’re still in an infant knitting frame of mind. 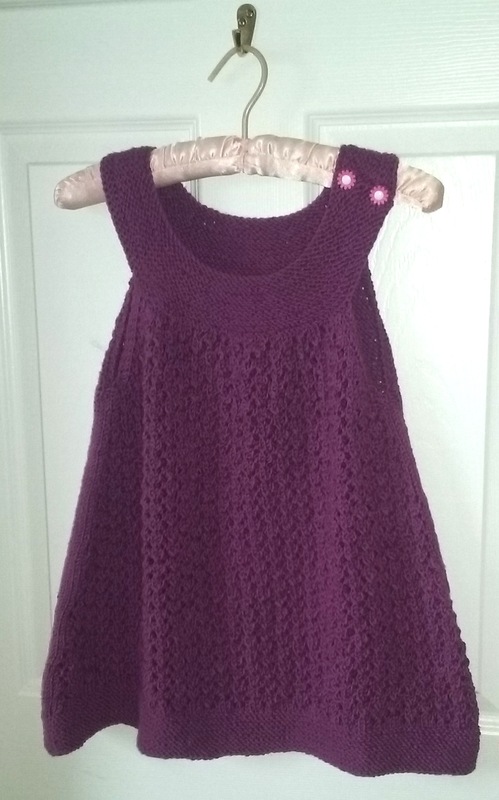 That said, it’s a clearly written and very easy to follow pattern that I was able to pick up and put down and knit on in the car with no problems, which contributed to its timely completion. The garter neckline is worked back and forth with increases to create the shaping (note: you have to work out the spacing of your increases across the row yourself). Then you cast off sections, start working the lace sections front and back and then join it and continue in the round. There are two button holes in the neckline strap and I chose these pink flower buttons which I had in my button stash. They’re a little tricky to fasten as the petals catch a bit, but I’m hoping they’re mainly for decoration and the dress/tunic will slip over her head. I’m afraid my pictures don’t do the lace section justice, whilst remembering to pack the buttons, I didn’t remember to pack the camera and my phone camera isn’t good in poor winter light. The colour in the first two pictures is more accurate and the yarn is Debbie Bliss Cotton Angora which was reclaimed from a moss stitch cardigan I made for myself years ago but never wore because the weight of the yarn just didn’t work with the design. Although technically an aran it knitted up to the DK gauge of this pattern just fine. 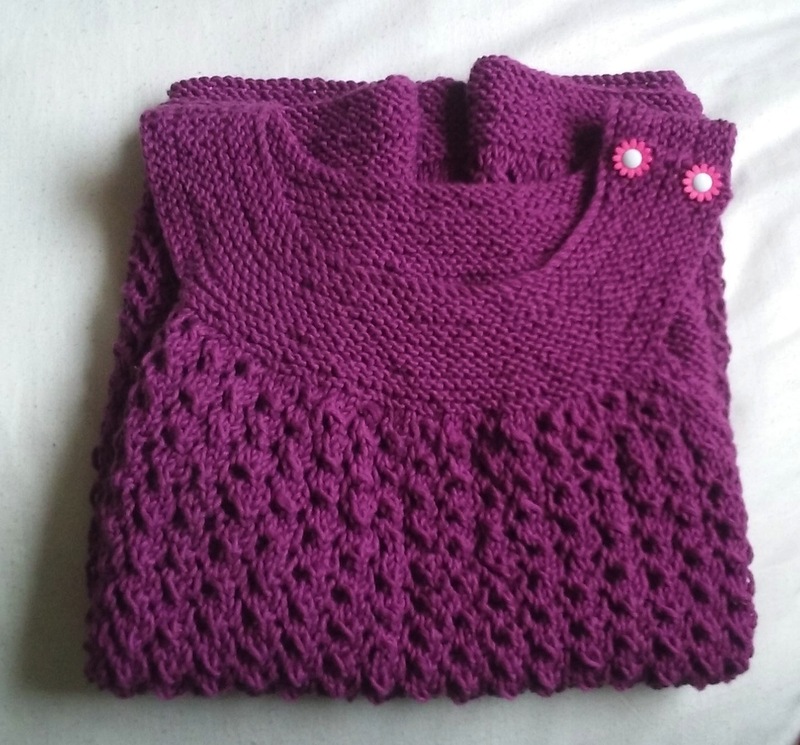 I also have a third knit gifted already (well wrapped up ready) which I knit back in the summer in a little spurt of ‘I really need to get a head start with Christmas Knitting this year” determination. It’s the Scrappy Felted Oven Mitt which I made for my brother from a chunky unlabelled lopi type yarn picked up from a charity shop eons ago striped with red lopi. I knit it exactly to the pattern except I wanted a hanging loop so after working the mitt I worked an applied I-cord all along the cuff cast on edge and made a loop by not attaching the I-cord for a few rows on one side. It was felted in the machine with a bit of plastic tied around the loop so it didn’t fuse together. I was really pleased with how it turned out. The thing with Christmas knitting early in the year however, is that you can forget that you even did it, which is what happened with this. I only remembered it when I came across the pattern as I was looking for the Milo pattern, so then the hunt for the glove was on. It surfaced and disappeared into the gift bag. A little aside – If you follow me on Twitter you may be aware that we were affected by Storm Desmond here in Lancaster, losing power on Saturday until generators were installed and got working in the early hours of Monday morning. However, those north of us suffered so much more with extensive flooding through parts of Cumbria. Having already raised $100 CAD for the Bike Rally for next year I decided to redirect the proceeds from subsequent purchases of my Ferrero Rocher Christmas Pudding Covers to the Flood Appeal administered through the Cumbria Community Foundation. They have a solid background in supporting those affected by floods in 2005 and 2009 and in responding to the 2001 outbreak of Foot and Mouth Disease which affected farmers in this area terribly. All proceeds will go to the CCF and I’ll cover the fees incurred via Ravlery and Paypal. So far £55 has been raised. 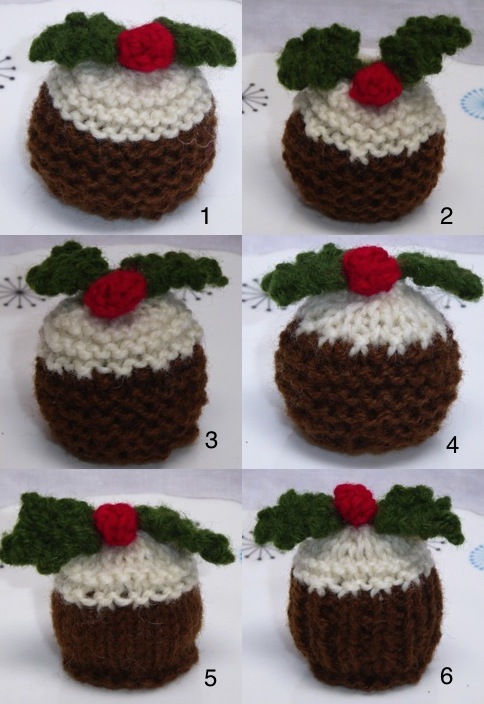 The Pattern costs £3.50 and has 6 designs for variations of Christmas puddings and I now have a second pattern which has 2 designs for Christmas Trees, which can be knitted in the round or flat. You can click below to buy through Ravelry (you don’t need to be a member to purchase). 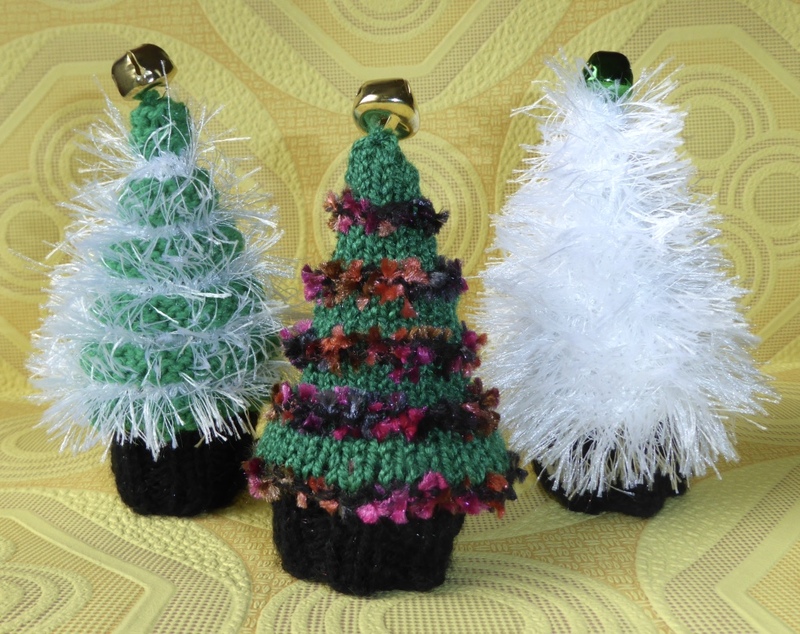 I hope your holiday knitting is going well.